← St. Anthony’s Weekend is here! In January’s musings I wondered if something was actually a “comeback” if nobody ever realized I was gone. Or if nobody ever noticed I was there in the first place. But the latter sounds like I need a little therapy, so I’ll shelf that for now. The race started just prior to 7:00 am. Due to the fact that I’m raising funds for the Scott Rigsby Foundation, I raced in the Charity Wave; a 7:05 start. Heading out on the first of three legs I only pulled about 30 seconds of “what-the-heck-am-I-doing-here-I-don’t-like-to-swim”. Second leg of the swim, and the current was pushing me along. Third leg? What a beast. Swam continuously and didn’t get far…except drifting too far to the right. Three times. A very long 36 minutes out there. Did I mention…who cares? I’m back! T1. Was. Endless. Peeing in wetsuit (ewww, yes I just wrote about peeing), pulling on arm coolers/sun blockers, chatting with the girls. Just so happy to be out of the water AND racing again! The bike was completely windy. Almost completely windy, as the last five miles or so was kind of fun. My glutes were working, my back was a little sore, but who cares. I’m back! T2 was spent trying to stand upright again. Whatever! The run. Hmmmm. I’m up to about 2.5 miles of pain-free running. Since it was a 6.2 mile course and I had just spent all my energy fighting wind (as opposed to breaking wind) I had no idea what was going to happen. I thought I might be able to run to each water stop, but that wasn’t happening. I think I took in way too much salt water on the swim, so my gut was pretty crampy (and really would have appreciated breaking wind). When I ran, I tried to keep my “good” pace…somewhere between 9:00-9:20/mile. I averaged much slower than that (like…10:20’s). But then again… I’m back! Through the race I plotted and planned future fundraisers. I comtemplated and solved a work dilemma. I channeled my friend Wendy Johnson, who (like me) had her share of difficulty on the swim throughout the years. Wendy passed away last Tuesday. I have no doubt that she was there, watching us all, pushing us along, and laughing at the thought I would consider bailing out of the swim. I thought of my brother-in-law’s cancer fight and the grace he shows. I looked for my friend John, who would probably have been happier to be racing than to be watching. I thought about Scott and all the work he goes through to change legs in T1 and T2, and how all he wants to do is empower others to get on their own unthinkable journey. Wow. I’ve come back. And I’m making my comeback. Does it matter if nobody ever noticed I was gone? With all the other things to think about on race day, I guess not. 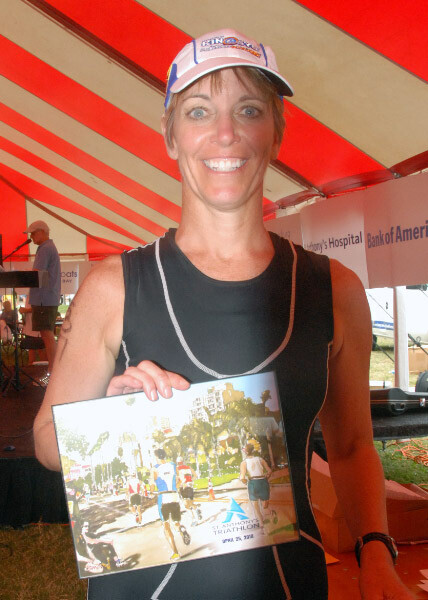 This entry was posted in Musings, triathlon and tagged resolution, running, Scott Rigsby Foundation, St. Anthony's Triathlon, swimming, triathlon. Bookmark the permalink. keep smiling! again, so glad you’re back!